There are two main reasons that people bring their kids to Hot Ground Gym: our Junior Boots kids’ fitness program or a kids’ birthday party. 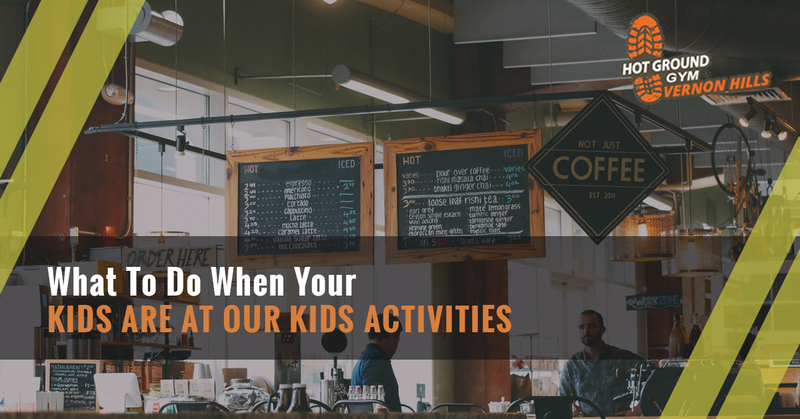 Now, if you’re the parent at your own child’s party, you’ll probably be sticking around, even though we take care of everything for you and there’s no cleanup involved. After all, you’ll want to take pictures, right? But if you’re the parent of a child who’s simply attending the party or if you’ve dropped your kid off for Junior Boots, there’s really no reason to stick around. If all of your kids are here at Hot Ground Gym, you’ve suddenly got a bit of time for yourself. So what are you going to do with it? Hit The Bank – Banking needs to be done. Even though you might take care of most of it online, there’s always that one special task that can only be taken care of in person. Maybe it’s dropping off a signed item for the remortgage, or maybe it’s finally time to get those passports back in the safe deposit office. Either way, you have time to get out of the car and enter the bank. Go For Coffee – If you’re a coffee drinker, you could use this short amount of time to actually go in and see everything they have to offer instead of just going through the drive-through. You could even break out the Kindle and read for 30 minutes. Pick Up Dinner – Depending on the age of your child and when that particular Company meets, this might be the perfect opportunity to go pick up something for supper. That way, when you pick them up, you can head straight home and know what you’re going to eat. Run That Quick Errand – There’s always that one errand that’s difficult to do when the kids are around. Maybe you need to order an ice cream cake but can’t do it because they’ll talk you into a cone. Or perhaps you need to do that super-boring thing that they’d just complain about anyway. Do it now when there aren’t distractions. Stick Around – Don’t want to go anywhere, especially if the weather is bad here in Vernon Hills? Just stick around and take a breath, check your facebook, respond to some ignored emails, or watch your kids have fun at our kid’s gym! …you have about 90 minutes. That means you have a good amount of time to head out and take care of something. Go Shopping – While you might not have the time to find the perfect outfit for the next wedding you’re headed to, we’re sure you can get some more “minor” shopping done. Whether it’s something necessary like groceries or something a bit more fun like jewelry or camping gear, there’s bound to be some shop nearby where you can spend an hour and a half. Get That One Thing Taken Care Of – You know…that thing that’s been on your list for a long time and you wouldn’t dare do with the kids around. Pick up the will and estate planning paperwork at the lawyer’s office (so you don’t have to explain to your kids what it is), schedule a trip to get your eyebrows waxed, have the dermatologist do a mole check. You’ll be happy you finally took care of that thing (whatever the thing is!). Hot Ground Gym gives you the time to get stuff done, and we’ll make your kids healthier while you do. Any questions? Contact us today!